Navid is an small iranian built and launched Earth observation satellite. It was placed into an orbit at an altitude between 250 and 370 kilometers. 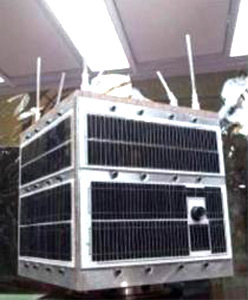 The Navid satellite was reportedly built by students at the Iran University of Science and Technology (Elm-o Sanat university) in Teheran. It features a panchromatic imager with a resolution of about 400 m.
An improved version, Navid 2, has been developed and renamed Tadbir.